Find horseback riding trails in New York at a variety of beautiful locales. Take advantage of the best horseback riding in NY by searching our complete guide to stables, campgrounds, and trails in the state. 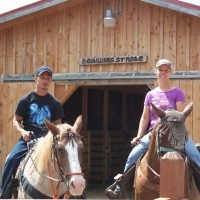 Enjoy horseback riding in New York in the Adirondacks Mountains and other great riding areas. Pine Ridge Dude Ranch - the Dude Ranch with a heart, in the heart of Ulster County! Pine Ridge is a family-owned and operated all-inclusive resort located less than 2 hours from the NY/NJ metro-area, most of southern NY (upstate), western MA, western CT and north-eastern PA. We feature about 150 acres of riding trails in the picturesque Catskills Mountains as well as indoor and outdoor pools with double-flume water slides, nightly entertainment, a Social Director coordinating daily activities the whole family can enjoy and so much more! Why visit a fancy ranch with fancy prices? Our down-home hospitality and affordable all-inclusive prices make us the ideal day trip or vacation destination for families, schools, Scouting or social groups. Horseback trail rides are available no matter how much or how little experience you have riding. We also offer hands-on educational experiences like the "Own a Horse for a Day" and "Barn Buddies" programs*. Young and old alike can experience the cowboy or cowgirl lifestyle during one-on-one horse-care sessions led by one of our Wranglers, a truly up-close and personal experience with our 4-legged friends. All-inclusive stays include one horse trail ride or alternative horse experience per person, 3 all-you-can-eat meals per day, unlimited snack bar visits, nightly entertainment, use of all of our facilities including indoor and outdoor pools, extensive hiking trails, a lake for paddle boating and fishing (bring your own fishing equipment), a gigantic outdoor bounce pillow, playground, mini-golf course, Horseshoe Pit, Bocce Court, Basketball Court, Tennis Court, Paddleball Court, Archery Range & indoor and outdoor activities (like Bingo, Scavenger Hunts and Arts-n-Crafts) planned by our Social Director and FREE Day Camp for the kids in case the grown-ups want to take a romantic ride or kick-back by the pool for a spell. Tell your folks, we also have AMAZING M-F rates for Senior Citizens ($299.00 per person/double occupancy for all 4 nights!) Call (866) 800-0859 for Reservations or if you need more information! NY Horseback Riding for the Whole Family! A full service equestrian facility in NY, Bronx Equestrian Center offers both Western and English style riding for all abilities. From trail riding to pony rides to haywagon rides, you are bound to find riding activities that both you and your family will enjoy! 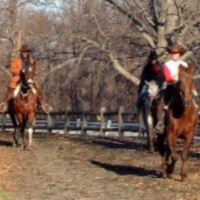 Enjoy a relaxing trail ride through New York's lovely Pelham Bay Park. If you're planning to book pony rides for your child's next birthday, you can do so on site or the staff will bring the ponies to you! The venue contains a party room that can be rented out for two hours. Horseback riding lessons are available for ages 6 to adult. If you own a horse and are seeking boarding services, the Bronx Equestrian Center has over 40 stalls on premises. The equestrian center is open everyday, all year round from 9 A.M. until dusk. Great Horseback Riding Lessons for Kids and Adults! Founded in 1994 by two former Olympians, Riverdale Equestrian Centre boasts a staff of qualified instructors who specialize in a broad variety of riding disciplines. 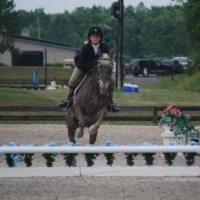 They all have more than a fair share of experience teaching riders of all ages and levels. Riding lessons are available for children and adults. Go riding in a beautiful country setting with four outdoor arenas, giving you ample space for crowd-free riding. 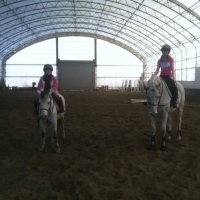 With the addition of an international size indoor arena, riding lessons are available all year round! Riverdale also offers horse boarding services; including up to three daily meals, daily turnout, on-call veterinary care, on-call farrier services, grooming, tacking, horse training, blanket cleaning service, and clipping services. English and Western Horseback Riding Lessons for all Levels! As the only remaining stable in the Prospect Park area, Kensington Stables offers friendly, accessible, and affordable equestrian activities for New Yorkers and tourists to enjoy. 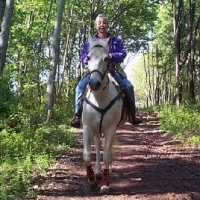 Ride along one of the great horseback riding trails in NY, on a 3.5-mile bridle path through scenic and varied terrain. Riders of all levels can participate. Whether you're an advanced rider or an enthusiastic novice, you can get riding lessons from one of Kensington's friendly instructors, who will do their absolute best to help you reach your riding objectives. Both English and Western lessons are available to anyone age 6 and up. If you need to rent a horse for an upcoming event; the stable offers pony parties and carriage rides. Some of the Best Horseback Riding on the East Coast! 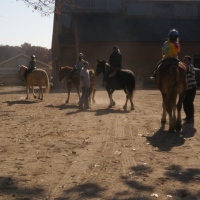 A family-owned equestrian facility in New York, Jamaica Bay Riding Academy has been serving riders of all abilities since 1972. Offering some of the best horse back riding in New York and all of the East Coast, the venue is located in the Gateway National Wildlife Preserve, encompassing over 400 acres of manicured wooded trails and three miles of beach front. Services include trail riding, lessons, horse leasing, horse shows, summer camps, therapeutic riding, and more! Enjoy such amenities as a 160 x 325' outdoor arena, a heated/air-conditioned lounge, and a 200 x 100' indoor arena. Also included on site are an intermediate cross-country course, an Olympic size dressage arena, and a full tack and apparel tack shop. Fun, Exciting Programs for All Types of Riders! Lakewood Stables is home to dozens of horses, as well as many fun and exciting programs for all types of riders. Master your horseback riding skills as you enjoy the scenic trails of Hempstead Lake State Park. Each trail ride is an hour long and you must be 13 years of age or older. 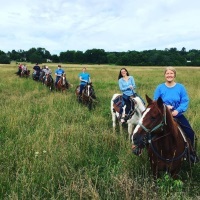 Programs include English and Western riding lessons, summer camps, girl/boy scouts, brownies, pony rides, birthday parties, horse care clinics, boarding, and horse training. Beginning riders are encouraged to take 30-minute private lessons, before starting group lessons. Birthday parties are available at the ranch or at your house. English and Western Horse Riding Lessons for All Riders! With over 900 acres of scenic bridle paths for trail rides, Sweet Hills Stables is a great spot for horseback riding in New York. The venue contains three outdoor lighted rings and an indoor lighted riding arena. 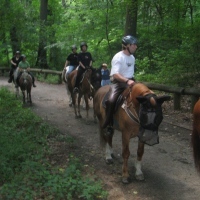 The hour-long, guided trail rides take place within beautiful West Hills County Park. All riders must be at least 8 years old and a minimum of 2 people are required. English and Western riding lessons are available for beginner to advanced riders. If you need pony rides for your child's next gathering; pony parties are available for birthdays, block parties, picnics, and other fun events. Sweet Hills is open year round, 7 days a week. 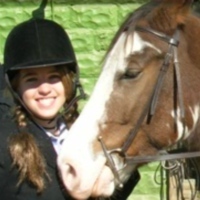 Great Horse Riding Lessons in New York! Whether you're a novice or experienced rider, Lynne's Riding School will ensure that you maximize your abilities on the saddle. Lessons begin in the indoor ring, where you'll learn technique until you've accomplished control of yourself and your horse. Then you head out to the lovely bridle paths of Forest Park for group lessons. If you book a private lesson, discount packages are available. If you're interested in boarding your horse, box stalls are available for your convenience. All horses are fed three times a day and the stalls are always kept clean. Lynne's private party room/indoor ring is available for birthday parties and other fun occasions. Also available are pony rides and school/camp courses. Scenic Horseback Riding Trails in NY! A 200-acre facility in New York; Circle A Ranch offers horseback riding, boarding services, horse training, lessons, horse transport services, and horse camps. All activities are supervised by reputable professionals with plenty of experience in the horse riding industry. Choose from a series of beginner, intermediate, and expert horseback riding trails. Experience amazing views of the Catskill mountains and the countryside. The facility is conveniently located near a series of great NY attractions like Howe Caverns and the National Baseball Hall of Fame. You'll also be close to several local campgrounds, eateries, and shops. A Beautiful Horse Riding Farm in New York! A family-owned horseback riding establishment in NY, Dreaming Tree Farm is located in the heart of horse country, nestled between the Catskill and Berkshire Mountains. 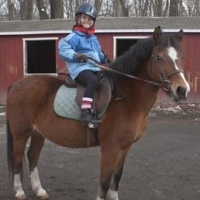 Riding lessons are available for children and adults of all skill levels. The staff includes three instructors in hunt seat equitation, an instructor in western seat equitation, and an instructor in natural horsemanship. Both private and group lessons are available. Also available are boarding services, carriage services, fox hunting, and summer camps. The farm is located 2 1/2 hours north of New York City and 1/2 hour south of Albany. If you have any questions, call 518-312-6387 or send an e-mail to dreamingtreefarm@yahoo.com. First-Class Horse Boarding Services in NY! A privately owned horse boarding facility, Richer Farm specializes in coaching instructors and trainers. Enjoy some of the finest horseback riding trails in New York in the beautiful, 300-acre Claypit State Park. Dedicated to providing all horses with the best possible care, the farm offers full boarding services. Farrier and vet visits will be scheduled. Boarding amenities include food twice a day, continuous hay, daily turnout, stall cleaning, rubber-matted stalls, and 24-hour supervision. Hours are 6 A.M. to 11 P.M. seven days a week. The facility is open all year round. If you have any questions, please call 718-967-0742 or send an e-mail to richerfarminc@aol.com.